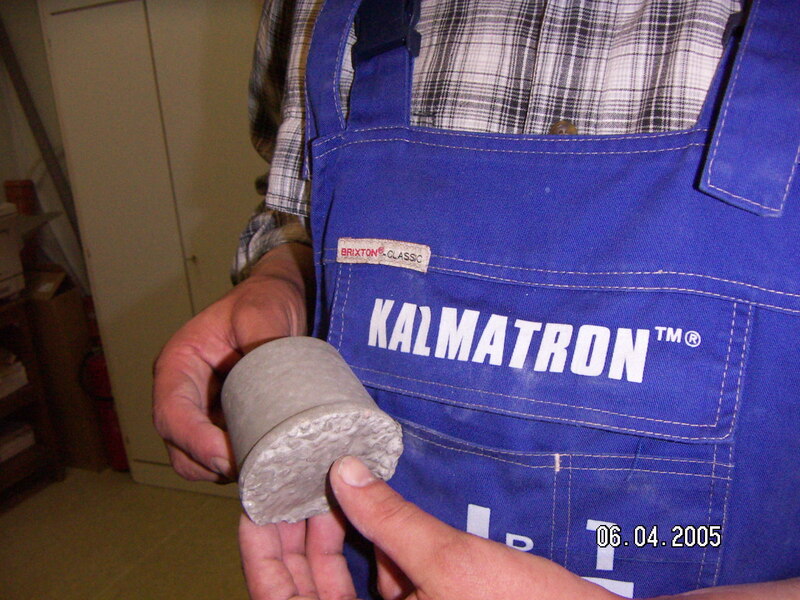 KALMATRON® KF-ASH is an additive to the concrete mixes containing over 50% of Industrial Incinerated Waste (IIW) from the weight of cement. 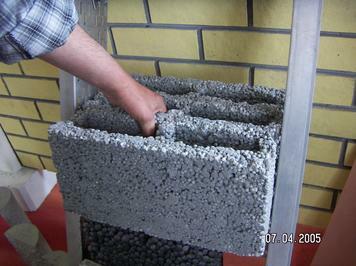 In order to utilize IIW with maximum benefits, that concrete can be used for building of insulated structures. Also it is widely recommended for building on remote territories for utilization of contaminated or low grade local building materials. KALMATRON® KF-ASH provides maximum of cementitious value to concrete mix and prevents leaching of unstable phases from IIW by encapsulation of insoluble impurities. It increases the field of IIW utilization for chemically, biologically or organically contaminated raw materials. Below is an example of 2 concrete mix designs for blocks production based on conventional coarse sand and natural volcanic sand (Mexico). Volcanic sand is highly soluble in water that's why it has no industrial value by itself. Applied KF-ASH additive provides encapsulation of volcanic sand preventing from contact with water during of batch preparation. 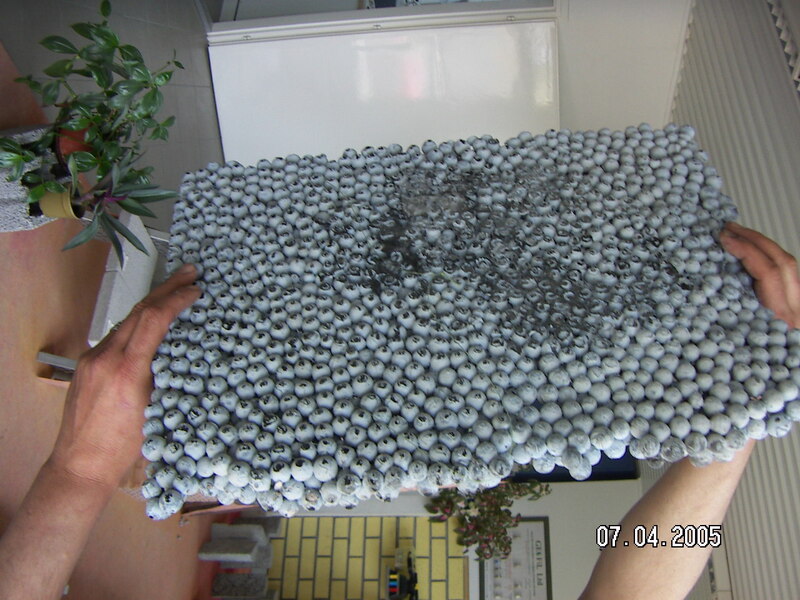 After hardening it results in "honeycombed" cement rock matrix with numerous amount of voids functioning as thermal insulation of concrete structure. When IIW comes from metallurgical facilities it contains sub-ferro elements then performance of KALMATRON® KF-ASH might be considered as providing the features of High Performance Concrete (HPC). The petrography of that concrete may even exceed the modern standards of structural concrete. 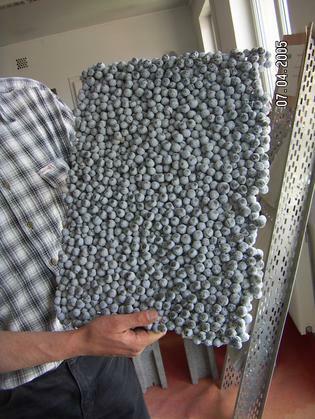 Another type of IIW is a recycled glass where KF-ASH performs absolute adhesion of the glassy shells or balls to provide structural elements with density at 400 to 600 Kg/m3. 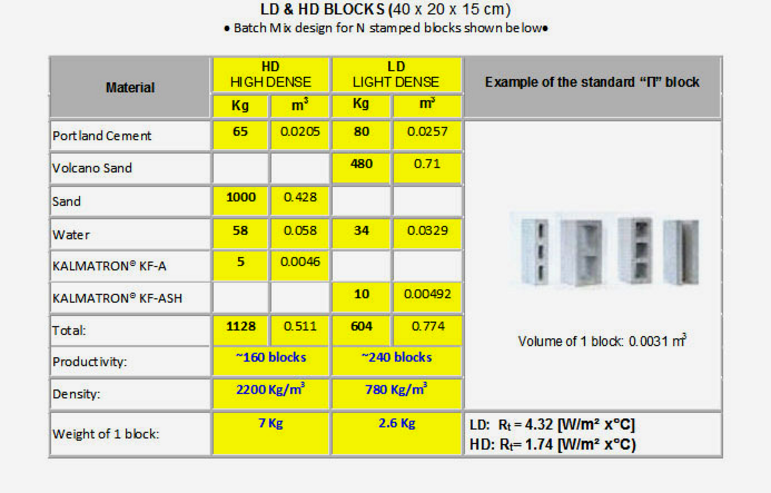 The structural elements are ranged from thinnest separators to the panels and wall blocks as shown below. thermal resistance at 5.5 [W/m2 C] and compres -sive strength at 28 MPa or 4,000 PSI.